"A good cook is like a sorceress who dispenses happiness". I will be leaving BCM also but I must say it has been so much fun doing this blog with Sathya for the last few years. I will be moving to http://www.coupleskitchen.blogspot.com/ with my parter and Sous Chef Jared. Sathya here, I just wanted to let you know, I have decided to move onto a blog of my very own - "Sathya's Kitchen Adventures". I have shared this wonderfull blog with my dear friend Liz for years, but want to have a fresh start and try a few different things on my own. If you want to share my journey, please add me to your favourites list, RSS feeds, etc on http://sathyaskitchenadventures.blogspot.com/"
These little beauties are delicious. It's one of Jared's recipes that he just pulled out of nowhere. He didn't have a recipe, he just threw different flavours together, which is a skill I'm slowly learning. I'm always a stickler for wanting a recipe to follow. 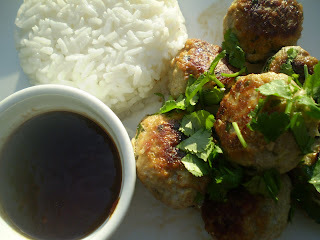 We made these on a Saturday afternoon when I had a huge craving for McDonald's and the last thing I wanted was a healthy Asian dish. But in the end I ate nine balls!! And the next day we flattened down the 3 that were left over and turned them into hamburgers with a big crusty roll, some rocket and the dipping sauce. We gave my mum the recipe to try and its now one of her regular dishes. Mix all the above ingredients together and roll into balls (or hamburgers). Cover with glad wrap and refrigerate for at least an hour. Cook over medium heat until golden brown. Sprinkle with some left over coriander. Serve with the dipping sauce and some rice on the side. If you have made them into hamburgers, serve with your favourite roll, fresh rocket and some dipping sauce. Sounds good right? Looks nice as well, don't you think? Well don't be fooled like I was, it was terrible. Actually, terrible might be too strong. It was bad. The combination of the mascarpone, ginger, parsley and honey did not work for me at all. As I've said here before, its always a disappointment when you go to some extra effort for dinner, then when you take that first hopeful mouthful you think, hmm not what I expected. Then the second and you realise yuk, its not good, I just waited time, money and calories. I did that recently with this. We were off to a friends for a big birthday gathering and I announced I would bring nibbles as I made the yummiest dip. Sarah, the host, was disappointed when I turned up with 2 containers of store bought dip and some crackers as I had talked this cucumber and feta dip UP! Funny how you look around a while later and see everyone's devoured the store bought crap and doesn't even know how you spent all morning peeling and chopping and soaking and mixing for them only to stick your little finger in at the end to check the seasoning and realise with enormous dread that somehow a cup of salt must have fallen in there or something! It was so ridiculously salty I needed a gallon of water after a tiny taste! Anyway, back to this risotto. I found it on Taste and loved the sound of it, only to be sorely disappointed. I bought a new camera recently. A DSLR and am trying to learn how to use it. I'm really enjoying all the new things I can do and am working out the best time of day as well as the best spots in the house for the right light etc. One of the best spots is at the back of the house where the sun directly hits. I wandered out there recently to try and get a good shot of this delicious cake. I spread out a table cloth and got started. After a while I noticed our cat, Kurty had joined me as you can see here. I continued to take photos and trying all the different tricks I've been learning and reading about. I'm not very good yet, hopefully I'll get there. The funny thing about Kurty is he's never been interested in our food. Only his fish. So you can imagine it's taken us by surprise to find him getting into food we've left out. This has never been a problem before so we're quickly learning we have to put everything away. I never thought he'd get into banana cake, but as you can see here he gave it a red hot go! This delicious banana cake came from The LA Times, and is a recipe from The Clementine Bakery which shares their secret is using pastry flour. I stumbled across this recipe at Amateur Gourmet who says its his "dream cake". I must agree its fantastic! Heat the oven to 350 degrees. Into a large bowl sift together the flour, sugar, baking powder, baking soda and salt. In the bowl of a stand mixer, or in a large bowl with a hand mixer, mash the bananas. Mix in the eggs, one at a time, until each is completely incorporated, then mix in the buttermilk, oil and vanilla. Finally, mix the dry ingredients into the batter just until thoroughly combined. Pour into a 9-by-13-inch greased pan. Bake for 35 to 40 minutes, until golden-brown on top, a toothpick inserted comes out clean and the cake springs back when lightly touched. Cool on a rack. In the bowl of a stand mixer, or in a medium bowl with a hand mixer, beat the cream cheese until smooth and there are no lumps. Add the butter and whip until incorporated, then add the powdered sugar and the sour cream. Frost the top of the cooled cake, then slice and serve. Jared and I went to Clare to stay with my parents for the weekend. Mum had a cookbook of Blue Ribbon Winning recipes! The prize winner from every country town in South Australia had featured. I chose the Blue Ribbon Peppermint Slice to recreate. And it tastes sensational. I can see why it received first place. I gave Jared a piece on the drive home from Clare and he said, "in all seriousness, this is quite possibly the best slice I've ever eaten!" I cant help but agree. Since making the slice and deciding to buy the cookbook I found it in I have discovered the author has her own blog! The Blue Ribbon Cookbook. Check it out! I also brought the slice to work and fed it to a friend of Jared's and this is the feedback I received: "have just eaten the slice. However the word eaten really doesn’t sum it up. It was more of a whole cuisine experience or a culinary journey. For god sake don’t ever make it again as Jared can’t possibly exercise more than he already does and he will make Jabba the hut look like a supermodel after 6 months of that. Of course I’ll be running again soon and could probably get away with a piece that size every 3rd day. Thanks". I had to double the filling and I also used 75g more chocolate than in the recipe. The recipe below is what I did. To make the base, melt the butter and condensed milk in a saucepan. Crush the biscuits and mix with the cocoa and coconut. Pour over the butter and condensed milk mixture and mix well. Press the mixture into a slice pan (about 20 x 30cm) lined with baking paper. Place in the fridge and chill well for an hour. To make the filling mix together the icing sugar, butter, milk, peppermint and food colouring. Spread evenly over the chilled biscuits mixture and put it back into the fridge to set. To make the topping, melt together the chocolate and copha. Spread the chocolate evenly over the filling and allow it to set before cutting the slice into squares. Can you see that cinnamon stick? And the cummin seeds? And the gorgeous juicy dates in amongst all that delicious goodness? Oh yeah, this is a lovely dish. My sister, Sal and her boyfriend, Liam came over for dinner recently. It was hard to know what to prepare as Sal is vegetarian, and a fussy vegetarian at that and Liam is a big time meat eater. Like any real Aussie male. I've really enjoyed cooking lately and am trying lots of different ingredients and techniques. We never had stews when I was a kid so its a new thing for me. I made a beef stew for the boys and this yummy vegetable tagine (from taste.com.au) for Sal and I all served with mashed potatoes. It's quite a sweet subtle flavour so its very different from dishes that usually come out of my kitchen but I enjoyed it. Heat oil in a saucepan over medium heat. Add onion and cook, stirring, for 5 minutes or until soft. Add the carrot, garlic, ginger, cumin seeds, paprika, cinnamon and saffron and cook, stirring, for 30 seconds or until aromatic. Add stock and bring to the boil. Add the pumpkin, beans and apricots. Reduce heat to medium and cook, stirring occasionally, for 15 minutes or until the pumpkin is tender. Add dates, chickpeas and lemon rind and stir to combine. I never ate seafood growing up. Even now I only eat whiting. But I ALWAYS ate Tunesy Morns. Our family lived for it. I always stared through the oven door at the golden crust on the top asking mum "is it ready yet? Is it ready yet?". I love my tunesy morns. When Jared and I first started dating I cooked it for him one night and he hadn't eaten it since his mum made it for him as a boy. He was well excited - and to top things off, he says my Tunesy Morns is the best he's ever had!! I've never shown him how to make it because that way he'll never leave me! I have however, shared it with both of our neighbours and we all enjoy tunesy morns evenings regularly. Preheat the oven to 180 degrees. Melt the butter in a large saucepan over medium heat. Once it starts to sizzle, add the flour and using a whisk, stir it around and let it sizzle for at least three minutes. Take the pan off the heat and pour in half the milk. Whisk quickly to remove lumps. Add the rest of the milk and return to the hotplate. Bring the milk to the boil, stirring occasionally. 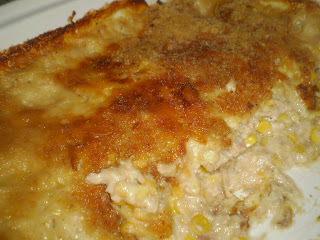 Once the sauce begins to bubble add the drained corn and tuna. Stir well and add S&P to taste. Wait until it begins to bubble again and pour into a ceramic dish. Cover the top with the grated cheese and parmesan. Sprinkle bread crumbs over the top of the cheese. Cook in the oven for at least half an hour, or until it is brown to your liking. Serve with a squeeze of lemon. I love tofu. I'm not ashamed to admit it. For many reasons, its so versatile and delicious when you add good flavourings to it. I know many people out there hate it, if so, then go to the next post. This little recipe comes from Serious Eats, an interesting place I regularly hang out. I liked the sound of it and it sounded healthy, all I needed was some tofu and off we went. It was a tasty and healthy meal but it was a fair bit of work for something that wasn't amazing. The flavour wasn't great. I needed chilli paste when I was eating it. I like the idea of painting a yummy sauce all over tofu and grilling it though, so although I won't make exactly this again, I will make something similar and make it my own. To make the miso sauce: put a bowl on top of a pan of simmering water, or use a double boiler if you have one. Put the miso in the bowl along with the egg yolks, sake, mirin, and sugar. Over the simmering water, gradually add the dashi. Stir until thick, and adjust seasonings to taste if needed. At the last moment, some lemon rind if you like. To prepare the tofu: Remove the tofu as a block from its packaging, and set it on a chopping board. Wrap the tofu in a clean tea towel. Weigh the block of tofu down with something heavy. Cut tofu into 2-inch blocks and lay on a tray and put under a hot grill it is browned and the tofu is heated through. Remove generously lather one side with the miso sauce. Sprinkle with sesame seeds and place back under the grill for one or two minutes, until the topping is browned. Serve immediately. I have a little something to tell you but I don't have a photo so you'll have to use your imagination. I'm hoping I can portray the deliciousness and ease with my words. I don't know if I can do it, but here goes. I'm not sure where or when this started for me, but someone somewhere in my universe mentioned soy chicken. It may have been a blog, it may have been in a magazine, maybe it was a friend or someone I was eaves dropping on at my local coffee hang out (I know, I'm pathetic, I'll do anything for some adult conversation lately. Including going to a coffee shop with Austen, parking myself next to the most interesting looking people and listening in to what they're chatting about). Anyway I Googled 'Chinese Soy Chicken' and this video came up. I fell in love with the lady who commentates the recipe while her her son pesters her in the background. Its gorgeous. I noted down what I needed and found myself making it for friends a few nights later. I had gone to the Adelaide Central Markets and gathered everything I needed hoping to make it for our fortnightly visitor Nikolas but it didn't happen so when my dear friend Hannah said she was coming to see Austen and I, I said, stay for dinner and whipped this up. We all loved it! I thought I'd made far too much but we demolished it with steamed broccoli tossed in oyster sauce and minced garlic. The chicken is tender and sticky and tasty and crunchy has no skin or fat left on it after the cooking process so it is wonderfully healthy, which I need at the moment (damn baby weight). Hey, if just one of you out there makes it then I will have succeeded. Add all the ingredients together except the chicken in a large pot and stir to make a paste. Add the drumsticks and cover with water and more soy sauce so the water is quite black. Stir thoroughly. Place on the stove and bring to the boil. Once it is boiling, turn it down to a low simmer and cover. After 30 minutes, turn the oven onto 180C and remove the chicken from the pot and place into baking dish. Roast the chicken drumsticks in the oven for 20-30 minutes, remove from the oven and serve with streamed greens. 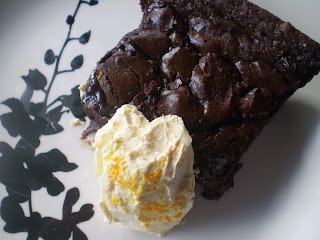 This is a Jamie Oliver recipe for brownies that are on the dessert menu at Fifteen. They look amazing in his cook book so I baked them on a cold Sunday afternoon as dessert after a Roast Lamb lunch. When they first came out I thought they were a failure because I'd taken them out too early. The entire centre was still really runny. It was more like a runny pudding when we ate it. I was so disappointed, although the flavour was UNREAL. I left them out over night and in the morning it had set! Exactly the way it was supposed to. I had perfect chocolate brownies. The entire tray was eaten within hours. I'll absolutely be baking these again. Such a decadent, moreish treat. And the orange zested creme fraiche was a sensational addition and created such a good balance between the rich chocolate and zesty sour tasting cream. Preheat the oven to 180 degrees. Line a 30cm rectangular baking tin with greaseproof paper. In a large bowl over some simmering water, melt the butter and the chocolate and mix until smooth. Add the nuts. In a separate bowl, mix together the cocoa powder, flour, baking powder and sugar, then add this to the chocolate and nut mixture. Stir together well. Beat the eggs and mix in until you have a silky consistency. Pour your brownie mix into the baking tray; and place in the oven for around 25 minutes. You don't want to overcook them so, you don't want a skewer to come out clean. The brownies should be slightly springy on the outside but still gooey in the middle. Allow to cool in the tray, then carefully transfer to a large chopping board and cut into chunky squares. Serve with a dollop of creme fraiche mixed with some orange zest. Recently we had a 'family weekend'. In Holland (where my family is from) this a a normal yearly occurrence with most families. Everyone goes away together for the weekend, we play games, watch movies, go for walks, cook, etc. Sometimes I love it, sometimes not so much. This family weekend was the first one in a long time and was great. We went to Victor Harbour, about an hour and half out of Adelaide and had a gorgeous penthouse apartment overlooking the ocean for 3 nights. The weather was terrible so we spent a lot of time in the apartment whale watching from the balcony. My parents were incredibly disappointed to return one afternoon and hear that we had spotted whales and they hadn't, while they had gone especially looking for them! The deal was that my parents paid for the accommodation and my sisters and I looked after the food. As you can imagine, we ate like kings! The highlight was a raspberry baked cheesecake which I found on cuisine.com.au and is by Stephanie Alexander and is simply titled "Best-ever Cheesecake". Let me tell you, it was! Oh my Lordy! I studded raspberries on the top and made a coulis and it was amazing. Honestly one of the best things I've ever made or eaten! Beat the cream cheese and sugar in an electric mixer until smooth. Beat in the cornflour, then add the eggs, 1 at a time, beating each time just until smooth. Add the lemon juice, vanilla and salt. Add the sour cream and beat briefly to combine. Pour the batter into the tin, sprinkle with raspeberries (pushing some into the mix) and stand the tin in a large baking dish. Pour boiling water into the dish to come halfway up the sides of the tin. Bake for 50 minutes, then turn off the oven but do not open the door for a further hour. I won a copy of Jamie Oliver's Ministry Of Food cookbook. It really does have some fantastic recipes in it and they're never difficult because they were designed for those of us who have never really cooked. I've heard many people say that Jamie Oliver's Chicken Korma recipe is bland and not that great - but after some investigating and reading a few forums I think it's actually his original, fancy recipe that people dislike; because this Ministry of Food Chicken Korma is DELICIOUS. Jared and I have cooked it and recooked it several times and it never lets us down. Cut the chicken into approximately 3cm pieces. Peel, half and chop your onions. Halved and finely slice the chili. Peel and finely chop the ginger. Pick the coriander leaves and finely chop the stalks. Drain the chickpeas. Put a large casserole type pan on a high heat and add a couple of glugs of oil. Put the chicken thighs into the pan and brown lightly on all sides for five minutes. Push the chicken to one side of the pan. Stir in the onions, chili, ginger and coriander stalks with the butter. Keep stirring it enough so it doesn't catch and burn but turns lovely golden. Cook for around ten minutes. 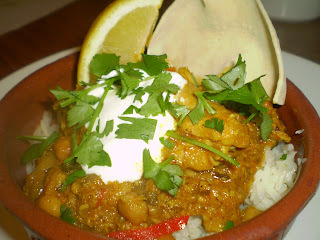 Add the korma curry paste, coconut milk, the drained chickpeas and dessicated coconut. Half fill the empty tin with water, pour into the pan and stir again. Bring to the boil, then turn the heat down and simmer for 45 mitues with the lid on. Check the curry regularly to make sure it isn't drying out. Add a little extra water if necessary. Remove the lid and cook down at a simmering heat for another 25 mins. Season with Salt and Pepper. Serve with rice. Add a few spoonfuls of natural yoghurt and scattered coriander leaves. Service with lemon wedges for spooning over. Every second week the gorgeous Nikolas comes to hang out with his Dad. I enjoy spoiling him and introducing new things into his little world. Nik hadn't had crumpets for example and they are now his favourite. Dinner is a little tough, he's a fussy eater so I am always searching for inspiration of what to cook. Shepherds Pie never fails however. Nik and his Dad love it. The crispy comforting mash potato and the meat filling served piping hot is such a wonderful winter meal. 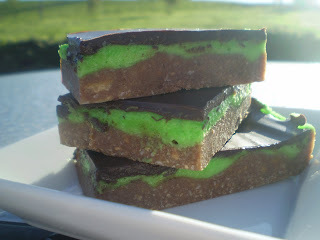 This recipe from www.taste.com.au is easy and perfect if you ask the three of us! Heat oil in a large saucepan over medium-high heat. Add onion, carrot and celery and cook, stirring, for 5 minutes or until soft. Add beef mince and cook, stirring to break up any lumps, for 5 minutes or until lamb changes colour. I stumbled across this gorgeous coconut cake and decided to make it for an after dinner treat with the lovely Liz. I've been getting a little bored at home and enjoying being back in the kitchen so was excited to see how this cake would turn out, because Julie over at 'Dinner with Julie' made it look and sound delicious. A few minutes into the process I realised I was screwed. I didn't have coconut extract. I did however have a few lemons in the fruit bowl so I mixed things up and used lemon zest and juice as the flavor for the cake and frosting. I'm glad I did, and so was Liz, cos it was perfect. Everything came together nicely and a delicious cake was enjoyed. Liz took a few pieces home for her and her new man and ate both of them, so it must have been good! Preheat the oven to 180°C. Spray two 8” or 9” round cake pans or one 9”x 13” pan with nonstick spray. In a medium bowl, stir together the flour, baking powder, and salt. In a larger bowl, beat the butter with an electric mixer for about half a minute, until it’s pale and creamy. Pour in the sugar and continue to beat for 3-4 minutes, until the mixture is light and fluffy. Add the eggs one at a time, beating well after each, and adding the lemon juice and zest along the way. Scrape down the sides of the bowl whenever it needs it. Add about one-third of the flour mixture to the butter mixture and stir it in by hand or with the electric mixer on low speed, just until it’s combined. Add about half the milk in the same manner, then another third of the flour, the rest of the milk, and the rest of the flour, mixing just until the batter is blended. Divide the batter between the greased cake pans and tap the bottoms a few times on the countertop to remove any air bubbles. To prevent a domed top, spread the top of the batter with a spatula, creating a slight dent in the middle and a raised edge. This compensates for the way a cake tends to rise higher in the middle. Bake for 30-35 minutes for round layers or 40-45 minutes for a 9-x 13-inch cake, until golden, the edges are pulling away from the sides of the pan, and the tops are springy to the touch. Let them cool for about 10 minutes before running a knife around the edge of the pans and inverting them onto a wire rack. Cool completely before you frost them. In a medium bowl, beat the butter and extract with an electric mixer until creamy. Add about a third each of the icing sugar and milk; beat and continue to add each until you have a spreadable frosting. Makes enough for 1 cake or a batch of cupcakes. Two close friends on different sides of Australia; keeping in touch online through our passion for creating cuisine and feeding our loved ones!